H.H. 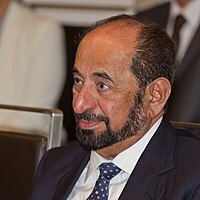 Sultan bin Muhammad Al-Qasimi, commonly known as Sheikh Sultan III (Arabic: سلطان بن محمد القاسمي‎; born 6 July 1939), is the sovereign ruler of the Emirate of Sharjah and is a member of the Federal Supreme Council of the United Arab Emirates. He has ruled Sharjah continuously since January 1972, apart from a six-day period in June 1987, during an attempted coup led by his brother Sheikh Abdulaziz bin Mohammed Al-Qasimi. The University of Exeter offers a friendly and cosmopolitan student experience. Its three campuses provide a safe and convenient learning environment for students from over 140 different countries and staff of over 50 different nationalities. The University’s excellent reputation and outstanding student satisfaction results are just two of the factors which motivate high-quality applicants to further their studies at Exeter. The University’s excellent reputation and outstanding student satisfaction results are just two of the factors which motivate high-quality applicants to further their studies at Exeter. The location in the mild and beautiful South West of England, with access to both city life and beaches assures those who live there of a very high quality of life. Undergraduate: Admission to the university is competitive, with an average of more than six students applying for every undergraduate place (2012/2013). Nearly half the number of undergraduate applicants (49%) apply with expected grades of at least three As at GCE Advanced Level (A-level) examinations (or equivalent).Referring to data published by the Higher Education Funding Council for England (HEFCE) in July 2011, Exeter has a high percentage of entrants with A-level grades of AAB or above (74.3% in 2009/2010). Exeter also had the 7th largest number of students (2368) with A-level grades of AAB or above that entered universities in England in 2009/2010. Referencing the same HEFCE admissions data, the The Daily Telegraph concluded that Exeter was one of twelve elite universities in England.Exeter was in the first group of UK universities to require an A* grade in A-level examinations as part of its standard offer for entry into some undergraduate courses. The Undergraduate Prospectus 2013 lists ten degree programmes that require at least one A* grade as part of the conditional standard offer, including Economics, English, History, and Mathematics.In the 2007/08 academic year, the university saw a rise of 23.8% in applications for places, against a national average of 6.4%; one of the highest rises among universities in the country. The 2012/2013 academic year saw applications rise a further 24.6% against the previous year, outstripping the national picture. Postgraduate: Students want to apply taught Master's programmes normally require a high Upper Second Class UK honours degree, or its foreign equivalent.